The Desktop Articulating Mount lets you optimize your LCD monitor viewing angle / position by providing full 3D ergonomic panel positioning. The advanced gas-strut and ball-joint mechanism allows effortless adjustments to be made to your LCD height, tilt, swivel, swing and extension. Achieve almost any viewing angle / position with a quick adjustment or retract the arm to a compact size increasing your work surface area. 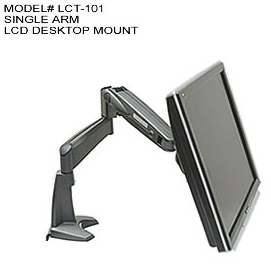 Perfect for office applications, it mounts easily to LCD screens and incorporates cable management. Designed to offer superior strength and ergonomics, the die-cast aluminum body is an attractive addition to any workspace. Designed to offer superior strength and ergonomics, this LCT-101 is an attractive addition to any workspace and is backed by Peerless’ 5 year guarantee.